We repurpose vinyl billboards into one-of-a-kind bags. Billboards are made out of durable vinyl and are typically 12' x 48'. Once their time high in the sky is done, they are shipped out to our California warehouse where they are washed and hand-cut into unique designs. Billboard vinyl is naturally durable, waterproof, unique, lightweight, vegan, and eco-friendly. We collect bold billboard vinyls from all over the country - currently repurposing 20,000 lbs. a month into one-of-a-kind products. We love typography, colors, and abstract designs. We aren't into faces, food, or logos, and our team has strict cutting guidelines. We wash and cut the vinyl in our Los Angeles headquarters, creating unique designs for every product. Each item is sewn to create a unique, high-quality, durable product where there's literally nothing else like it. 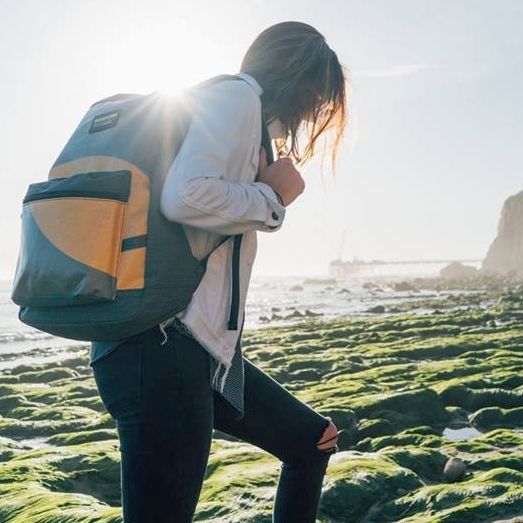 Each of our cut pieces are meticulously sewn together using high quality materials to ensure that your bag can endure whatever adventure you take it on. Visit rareform.com.